Design customized decor and gifts with this tutorial on how to create embroidery designs using PicMonkey. I used to cross- stitch as a little girl, so I guess it was only natural that I would fall in love with the charm of things embroidered. I love using embroidery to decorate my home and personalize gifts for friends. A few weeks ago I was in need of a special gift for a friend and I decided to give her embroidered towels. I knew what I wanted my design to be, but I wasn’t sure how to actually get it on the towel since I absolutely can’t draw. I have used Sulky Sticky Fabri- Solvy before for embroidery design, but I needed to come up with a way to create my design before it could be printed. Since I’m very familiar with PicMonkey, and it’s so easy to use, I decided to create my design there. 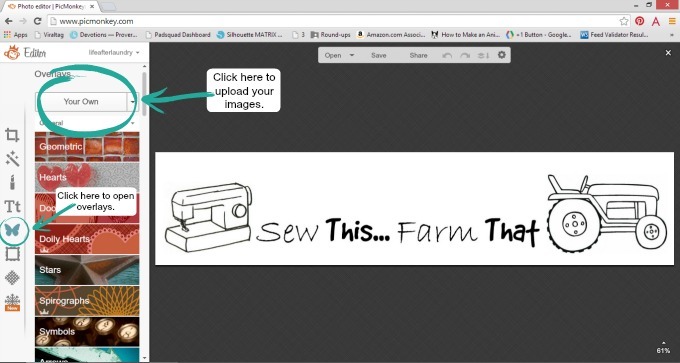 Below you will find the steps I took to create my own embroidery design using PicMonkey. When you open PicMonkey you will have the option to click on “design.” That will give you a blank canvas for creating your design. Resize the working area to 1700 x 2200 pixels to ensure you aren’t creating something too big to be printed. Using the text option you will find a great selection of cute fonts to use if you are in need of lettering. 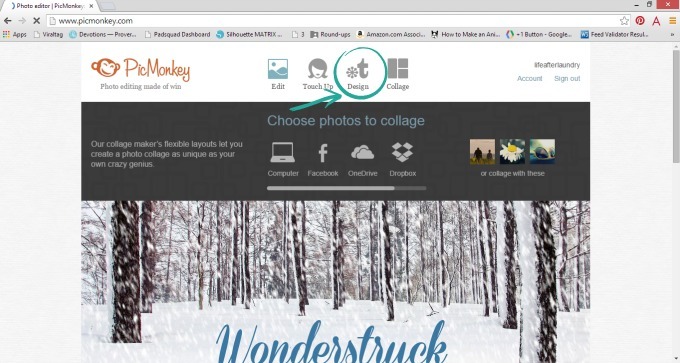 PicMonkey also imports any fonts from your computer, so if you find a cute font online, install it to your computer, and it will show up under the “Yours” section. If you want to add other elements to your design you can do so using overlays. Using “your own” button, you can upload images that are saved to your computer. I knew I wanted to add a tractor and sewing machine to mine, so I found images that were free to use online. 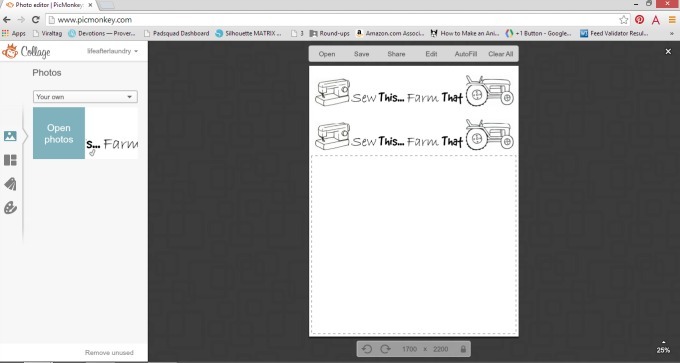 I actually googled tractor and sewing machine coloring pages to find images. Since coloring pages consist mainly of outlines they work perfect for embroidery. Crop down your image, removing the empty space. Save your creation. If you are wanting to print your design, exit out of your design and return to PicMonkey’s main page. There you will select the collage option. Open up your newly created design. Resize your collage to 1700 x 2200 pixels. Add your design to the collage. You can resize and delete the blocks in the collage so that your image fits. You can also add the same design to multiple blocks, like I did. I was trying to get the most out of my Sulky Sticky Fabri- Solvy Sheet. When you have your design added, save your collage. 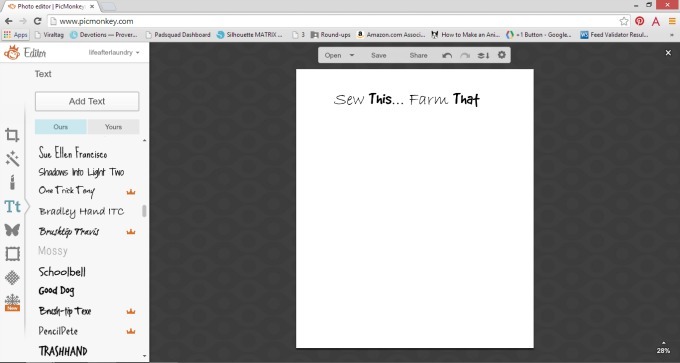 To print, open your design in Microsoft Word or Google Docs. Adjust margins to zero and alignment to center. You can find more information on printing PicMonkey creations here. I hope you will find this tutorial helpful. PicMonkey didn’t pay me to write this post. I just had a dilemma (how to create my own embroidery design) that they were able to help me with and I wanted to share. Over my years of blogging I have used them for designing and photo editing, and it has always been very user friendly. I love their fun fonts, little graphic overlays and the backgrounds that are available. Now, I have even another reason to love them since I have discovered how to create embroidery designs. 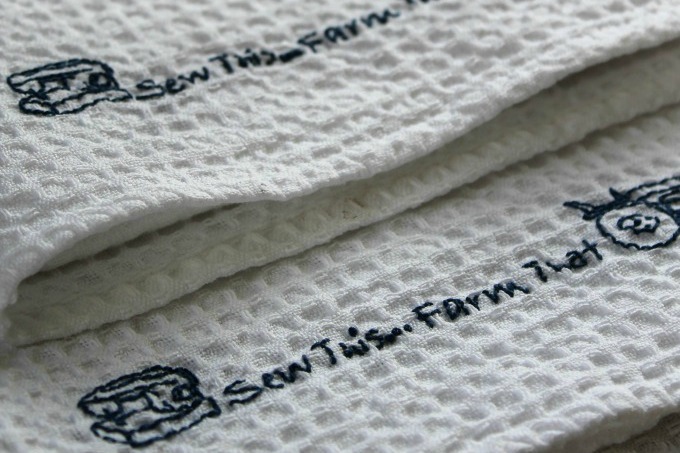 How do you get your embroidery designs on fabric? I love this idea. Pinning for later. Hope I get a chance to try it soon. Happy Crafting! & New Year! I hope you do too. Let me know if you have any questions. Happy New Year to you also! I love Sulky Sticky Fabri- Solvy! Love how you used PicMonkey to create your design, too! It is looking like a great tool for designing. I have never heard about this tool, however, after looking at your design, I will definitely try it out for my projects. Oh my goodness, this is seriously the smartest & coolest thing I’ve ever seen! I’m about to pass it on to some friends of mine as well as pin it! Thanks for linking up to the BestofBlogosphere link up! Be sure to link up again next week! how did you get the design to your fabric? I used Sulky Sticky Fabri- Solvy Sheet. I print it out onto the sheets and then stick it to my fabric. After I am finished with my embroidery, I wash it as directed and the sheet dissolves. 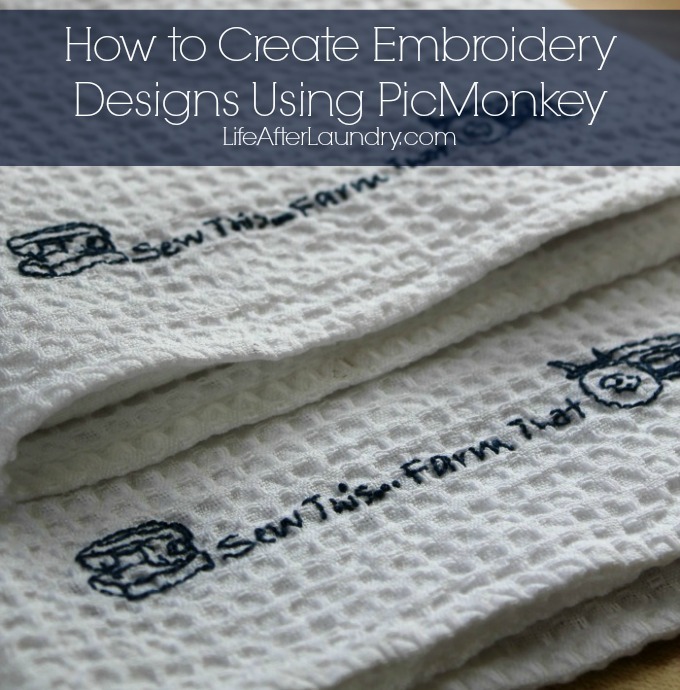 I hope to make do some cute embroidery with PICMONKEY although I’ve never worked with it yet.